This report deals specifically with olive oil, harmonized code: 1509. We cover the world’s top exporting countries, world’s top importing countries and the United States’ import market of foreign olive oil by country. In 2009 Spain was the world’s top exporter of olive oil. They exported 4.2 billion dollars worth of olive oil via ship. They exported 46% of the world’s total exported olive oil. Italy was the world’s second largest olive oil exporter, shipping out 3.1 billion dollars worth in 2009. Italy’s exporters made up 34% of olive oil exported globally. Spain and Italy together account for 80% of the world’s exported olive oil. The only other countries that command more than 5% of the market are Tunisia and Greece. 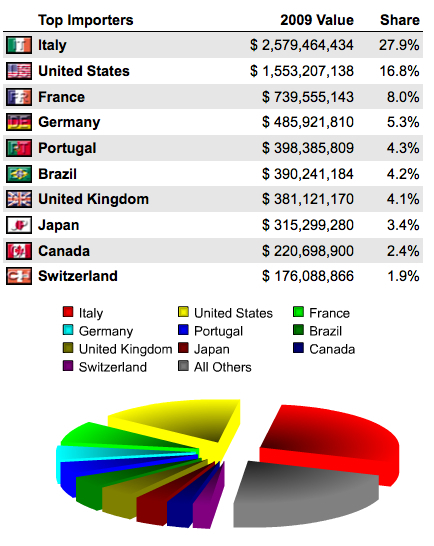 Below is a pie chart representing the top ten countries exporting olive oil, ranked by value exported and market share. Red represents Spain and yellow represents Italy. Italy is the world’s top importer of olive oil, spending 2.6 billion on foreign olive oil. United States is the world’s second largest buyer of foreign olive oil. The United States spent 1.6 billion dollars on foreign shipped oil in 2009. This accounted for almost 17% of the world’s bought oil. The third largest buyer of foreign olive oil was France, spending 740 million in 2009, representing 28% of the world’s market via ship. The top five importing countries account for 63% of the imported olive oil, which means that the distribution of olive oil is more spread out among a number of countries than the production. Below is a ranked order list and pie chart of the top ten countries importing olive oil, ranked by value and market share. United States is the world’s second largest olive oil importer. 88% of America’s imported olive oil comes from three countries: Italy, Spain, and Tunisia. This follows the world’s general trend of largest olive oil suppliers. America spent 482 million dollars on Italian olive oil in 2010. 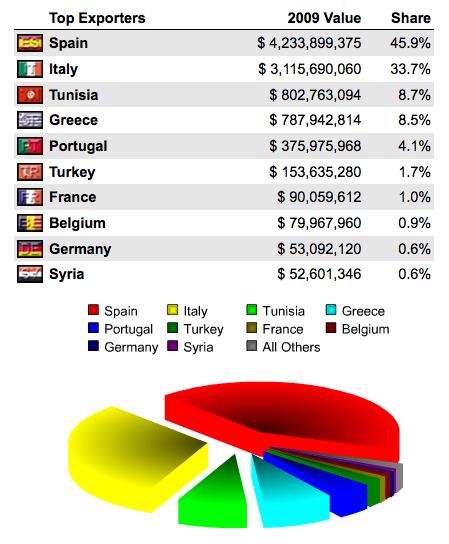 They spent 205 million on Spanish olive oil and 81 million on Tunisian olive oil. 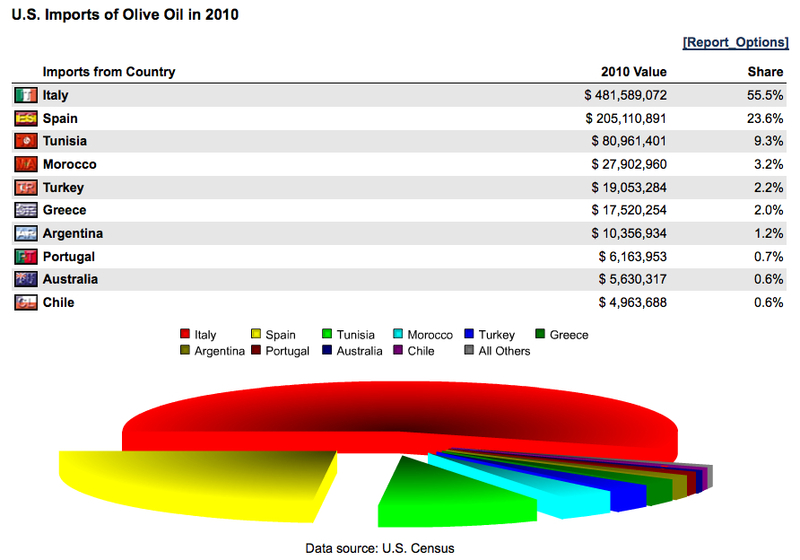 Below is a 2010 ranked list and pie chart of the top countries that the United States imports olive oil from, ranked by value and market share percent.